I always double this recipe and make four loaves, but you need a big basin to make that amount all at once. So, below is the two-loaf version. In a large bowl, dissolve 2 and 1/4 teaspoons active dry yeast in 1/4 cup warm water (slightly warmer than body temperature; to test, you should be able to stick your finger into the water comfortably). Use 2 and 1/2 teaspoons if you're making whole wheat bread. Let sit for about five minutes. Stir, and add: 2 tablespoons sweetener (honey or sugar or even maple syrup); 1 tablespoon salt; 2 tablespoons oil or melted butter or shortening; 2 cups warm water; 3 cups hard bread flour, whole wheat or white. I definitely recommend using hard flour, which is meant specifically for bread-making. At this point, you can also substitute 1-2 cups of the bread flour with dry, grainy additions, such as flax seed or flax meal, oats, millet, wheat germ or bran, sunflower seeds, ground seeds, or really anything your tastebuds desire. Raisins or other sticky dried fruits should be lightly dusted with flour before adding. Start by experimenting with a smaller amount. Joy of Cooking recommends using these in quantities no larger than 25 percent of the weight of the flour (which, to me, sounds like huh? So I just play around with the amounts). Stir, stir, stir, then begin adding the last 3 plus cups of bread flour. I recommend using some hard white flour even if you're making whole wheat bread; the loaves will be lighter and will rise more. Add this portion of flour by half cups, kneading to mix. 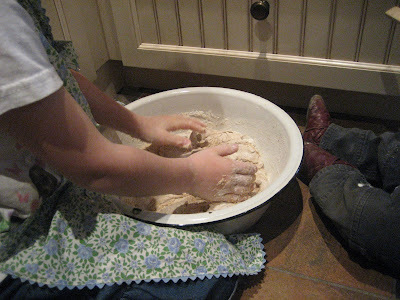 I knead in the bowl, on the floor (as Apple-Apple is demonstrating in the photo). You want your dough not to be sticky, but also to remain moist. This can take some trial and error. Don't keep stuffing more flour in just because you can or because the recipe suggests you should (as I've made the mistake in the past). A moist dough will rise better (not damp or wet). When you've kneaded to satisfaction and your dough feels silky and encorporated (ten minutes, more or less), lightly oil the surface of the dough, turn it in the bowl (I use the same bowl; saves on dishwashing), cover with a damp towel, and set somewhere warmish, not drafty, to rise. Let rise one or two hours. Grease two loaf pans. Punch down dough, cut into two equal pieces, roll each with your hands into a loaf shape and place, seam down, into the pans. Cover and let rise another one to two hours. Preheat oven to 450 degrees. You can add a pan of hot water to your oven to add moisture while baking (sometimes I do; sometimes I don't). You can also brush the loaves with butter or egg-wash or milk (again, I don't bother). Pop loaves in at this crazy high temp for ten minutes, (don't wander off! ), then turn down to 350 and continue baking for approximately 30 minutes (slightly less in my oven, but you'll have to play around with yours). To check that your bread is done, slip the loaf out of the pan and look at the bottom--you can rap it with your knuckles, too: bread is sturdy; it doesn't mind. If the bottom is a bit pale, pop it back in the pan, and into the oven for a few more minutes. When done, remove from pans and cool on racks. Or eat immediately with butter melting into soft warm squishy slices (be warned: bread is hard to slice when it's hot). If you make more than you'll eat in a day or two, freeze the extra. Fresh-made bread stales quickly.